I first tried chestnuts when I was a student in Paris. The holiday season was peaceful that year, as it should be, and I’ve cherished my memories of it all the more as intense protests are spreading through France, and violence has shattered a Christmas market in Strasbourg. In that long-ago December, though, my most consuming emotion was a kind of double nostalgia. I missed home, and yet I wasn’t quite ready to leave that beautiful city behind. As I walked for hours and hours gathering last looks, it was thrilling to get caught up in the sudden early darkness of winter and the elaborate holiday windows of the grand old department stores. During one evening promenade, I saw a street merchant who had anchored himself in the middle of the streaming agitated crowd and was patiently tending a pan of marrons grillés, freshly roasted chestnuts. The scene was so sepia toned, so achingly 19th century, that I had to have some, just to glut my sentimentality. I bought a newspaper cone of the hot aromatic nuts and managed to peel one with my cold fingers right there on the sidewalk. 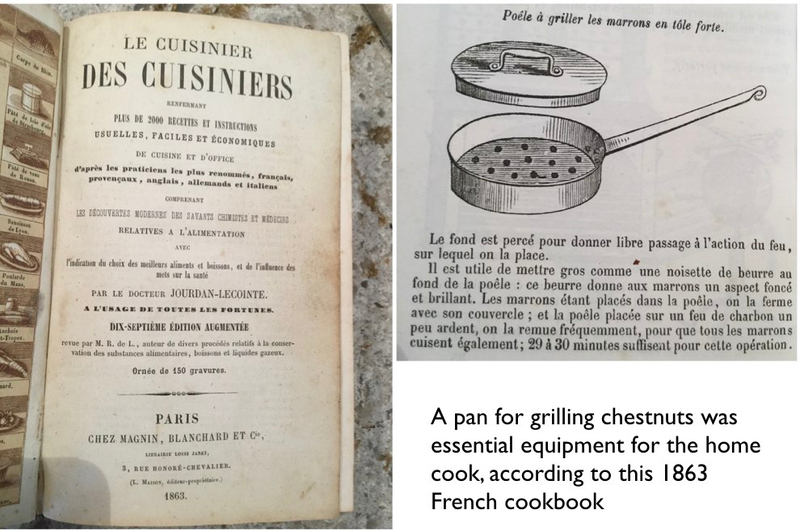 Chestnuts do not have the cultural meaning in the US that they have in France, where a chestnut roasting pan used to be considered essential kitchen equipment. My theory is that most Americans’ impressions of chestnuts are driven entirely by “The Christmas Song.” Can’t you just smell them roasting on an open fire? And Nat King Cole’s voice – a little sweet, a little smoky – tempts you to linger and savor the simple pleasures of the season. We all want to believe that chestnuts taste like that, but in reality very few Americans eat them. Although sweet chestnuts are grown commercially all across the country, from Michigan to Florida and Virginia to California, the US contributes less than 1% of global productivity (Agricultural Marketing Resource Center), and we don’t import many either. This year I found fresh local chestnuts at my neighborhood farmers market, and I decided to give them another try in my own kitchen. Their texture isn’t crispy and fatty like you’d expect from a nut. It is starchy, thick, and dry, like a potato left in the oven too long. But their flavor is very distinct and complex, and now that I’m older and have more realistic expectations, I like them. They are a bit sweet – a cross between a new potato and a parsnip – and a bit savory, with a good dose of umami flavor. They also taste a little woodsy or wild to me. No wonder they are often featured in sweet-savory dishes such as butternut squash soup or pork with a fruit reduction. Roasting brings out subtle buttery or caramel notes, although I didn’t detect those in steamed chestnuts. Monet reportedly preferred them steamed (Joyes 1990), and perhaps he topped them with a bit of country butter. Whatever you think of their taste and texture, these ordinary looking nuts are interesting to look at and tear apart, which makes the difficult task of peeling them a little more engaging. 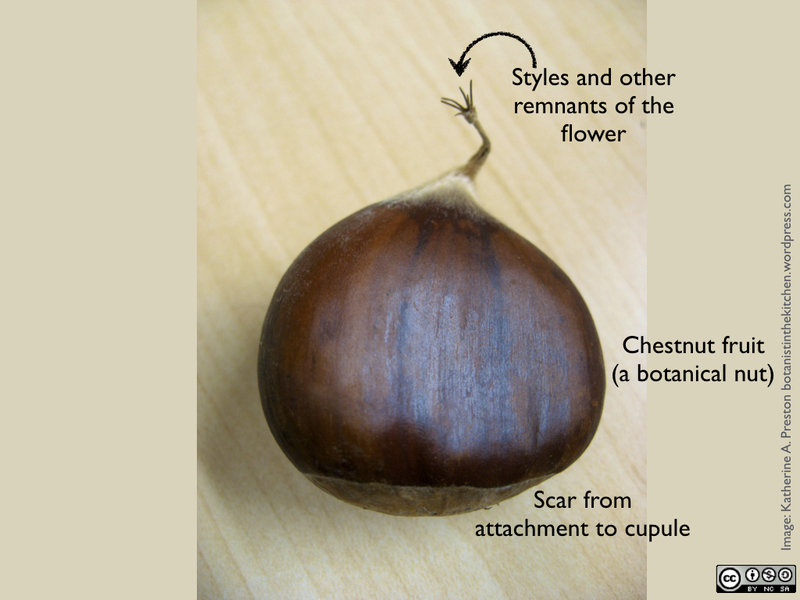 If you can find whole chestnuts at your local store or orchard, you’ll be able to identify some flower parts and see evidence that each one grew up as a triplet. Chestnuts are botanically nuts: they have a single seed inside a dry fruit wall that doesn’t open. Each nut comes from a separate flower, but those flowers develop in sets of three, snuggled up in a line inside a very spiny shared cupule. Cupules are familiar to most of us as the cap on an acorn. Chestnuts and oaks are in the same family (Fagaceae) and share this feature of their fruits, but unlike chestnuts, oaks develop only a single nut per cupule. The closely related beeches develop two nuts in their cupules. Chestnuts are separated from their cupules during harvest, but in your kitchen, you can deduce whether a given chestnut was in the middle or on the end of its row of siblings. End nuts have one flat face and a broad rounded side, where as middle nuts have two flat faces and a narrow rounded side. The pale rough patch on the bottom of a chestnut is where it was attached to the cupule. A triplet of chestnuts, as they might have sat in a cupule. Note the more triangular shape of the nut in the middle. Plant morphologists debated the origin of cupules for a long time. The consensus now seems to be that the nuts and their cupules represent a highly modified and complex flowering side branch at the base of an otherwise pollen-bearing (“male”) inflorescence (Fey & Endress 1993; Manos et al. 2001). At the tip of each of these pistillate (“female” nut-bearing) inflorescence branches, the central flower along with its two adjacent flowers develop and become chestnuts while the would-be flowers below them instead come together to become the cupule. The spines or scales evident on cupules are modified branches of that flowering axis. Fresh chestnuts will often still have flowers attached to their fuzzy pointed tips, and it’s probably worth looking for these as a sign of gentle handling since harvest. Female chestnut flowers are very small, but they have relatively long styles that flare above the cupule and catch pollen. Normally, you would cook chestnuts before peeling them, but it’s easier to see their structure if you peel one raw. Start by placing the nut on a cutting board and pressing down on it with the flat of a wide bladed knife to loosen things up. Then carve an X through the side of the nut, cutting deeply enough to catch the seed inside. The shell of the nut (the fruit wall) will be thin and flexible enough to pull away with the tip of a smaller knife or your fingers. Notice that the inside of the fruit wall is covered in soft beige fur. Removing the reddish-brown seed coat from the pale seed inside can be difficult. Sometimes it pulls away easily but often you have to carve off some tenacious spots. Chestnut fans claim that the seed coat is easiest to remove when the nut is cooked and still hot, but all recipes admit that, even so, you must be patient. It’s time to put on some Nat King Cole and sit by the fire. Fortunately, for our kitchen botany lab, you don’t need to remove the seed coat entirely. The raw partially naked chestnut can be split into two halves, which are large fleshy slightly wrinkled cotyledons. Cotyledons store resources that a seedling uses to fuel its initial growth. The main axis of the seedling lies between these halves at the pointed end of the nut. When a chestnut seed germinates, a root and a shoot develop from that axis and emerge from the seed, while the cotyledons stay behind, underground, supporting the young seedling. Whether you roast or steam your chestnuts, first score them with a knife as described above, making sure to cut through the seed coat as well. Doing so gives you an essential head start on peeling, and it keeps the nuts from exploding in the fire or oven. Street vendors often make a single deep slash across the chestnut, but I like to carve an X because it makes a prettier roasted nut. The shell around the crossed cuts curls back on itself and reveals the pale fuzz inside, like the lambswool lapels of a leather jacket. The look is less Belle Époque Paris and more American western, like something you would wear when you saddled up a horse to ride into the mountains and chop down a rustic Christmas tree. Once you have cut all the chestnuts and put the knife safely away, you can open the wine. Many sources recommend pairing roasted chestnuts with a young, slightly sparkling red wine to cut through the dense dry mouthfeel of the chestnuts. A smooth seasonal beer is nice, and I imagine hard cider would be too. Whatever you choose, I hope that the sparkles in your glass bring to mind the twinkling stars and holiday lights of a peaceful season around the world. Fey, B. S., & Endress, P. K. (1983). Development and morphological interpretation of the cupule in Fagaceae. Flora, 173(5-6), 451-468. Manos, P. S., Zhou, Z. K., & Cannon, C. H. (2001). Systematics of Fagaceae: phylogenetic tests of reproductive trait evolution. International Journal of Plant Sciences, 162(6), 1361-1379. This entry was posted in Botany Lab of the Month, Fruit, Recipes, Uncategorized and tagged Fagaceae, Katherine Preston, morphology. Bookmark the permalink. 1) LOVE LOVE LOVE YOUR BLOG!! There’s a great book about the history of the American chestnut, the fungal blight, and the efforts at cross breeding and modifying this once-iconic American tree. Yes, thank you for supplying the links. This story is just too interesting for me to have done it justice here (so I just bypassed…. ), but thank you for giving readers some solid resources. I did not know about the Kingsolver connection. Will have to check that out! Thanks for these resources, Diana. And thanks for reading.